Saving time and increasing profitability with streamlined quoting software. Reschcor Inc. is a family owned and managed custom plastic extruding business. Reschcor was started in 1982 with only two extrusion lines and now has 18 extrusion lines and 120 employees working in an 88,000 square foot manufacturing facility located in Bristol, Indiana. Reschcor had expanded its manufacturing capabilities over its 35+ year growth history, building a reputation of providing creative solutions to customer needs. With orders that could include hundreds of possible material choices, Reschcor used a combination of spreadsheets and in-house developed software to create complex estimates. Quotes could be completed in a day, but collaboration was difficult and most estimates were produced by one person at the corporate office. When raw material price increases occurred, updating hundreds of quotes was tedious and time consuming. Reschcor needed custom software that could be accessed by multiple department within the company as well as by sales reps on the road. Consolidating the legacy software and spreadsheets into a single system was a top priority. Other important features included the ability to attach PDF drawing to a quote and seamless integration with the company ERP system. The RoleModel team started the project by learning about Reschcor’s requirements and what was unique about their business. RoleModel observed Reschcor’s existing quote-making process and uncovered workflow improvement possibilities that were not a part of the original requirements. RoleModel used this information to create a series of clickable prototypes in just a few days. User feedback from the prototypes was used to create the plan for the initial rollout of the software. RoleModel began software development using a “walking skeleton” approach. In the first few weeks, RoleModel built a simple, end-to-end version of the software. This bare-bones version helped Reschcor visualize the direction of the software’s development and avoid pitfalls. The new software was built on a "cloud" platform that enabled user access from anywhere. Management could use the new user access controls to define cross-department collaboration groups for each quote. The software used powerful business rules to generate quotes automatically, while allowing easy overrides for material minimums and other exceptions. The software included other workflow improvements. Automated batch processes were built to update existing quotes with raw material price changes, saving days of data entry. RoleModel replaced the old paper-based “inbox” with a digital work queue. Copying sections from one quote to another was made easy. A seamless integration with the ERP system was created to eliminate double data entry. 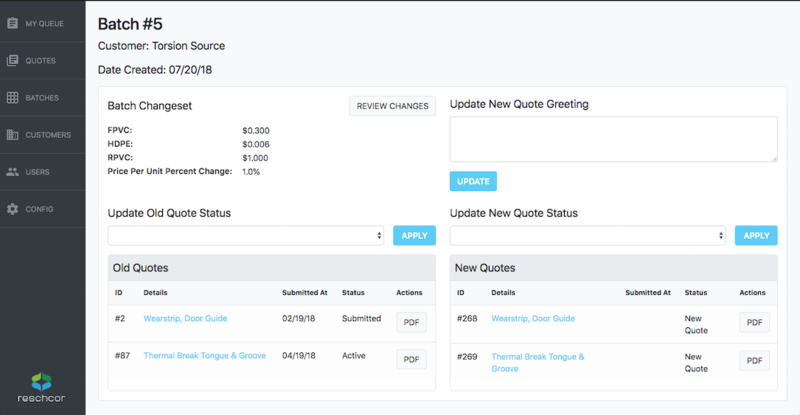 With the new custom software, Reschcor achieved its goal of faster, more collaborative sales quoting. Initial data has shown that with the new software Reschcor achieved a labor savings of 10-12 hours a week and an overall ROI of >30%.